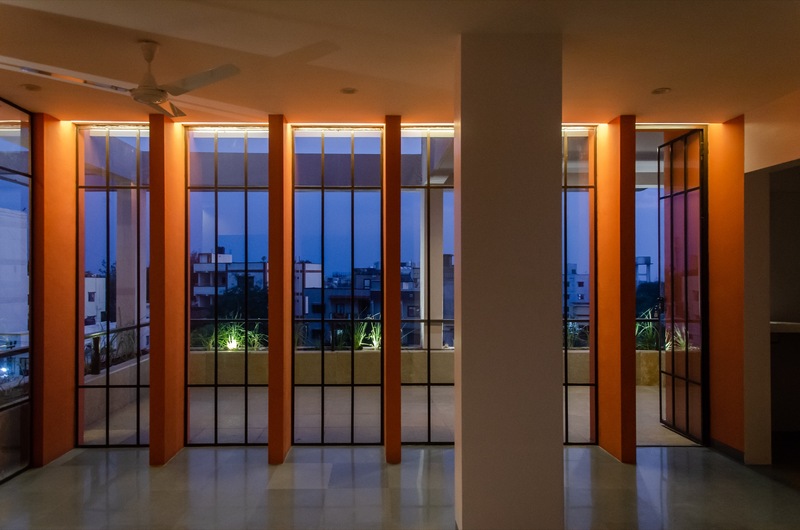 Interior Design: Shete House, at Pune, by M+P Architects Collaborative - ArchitectureLive! 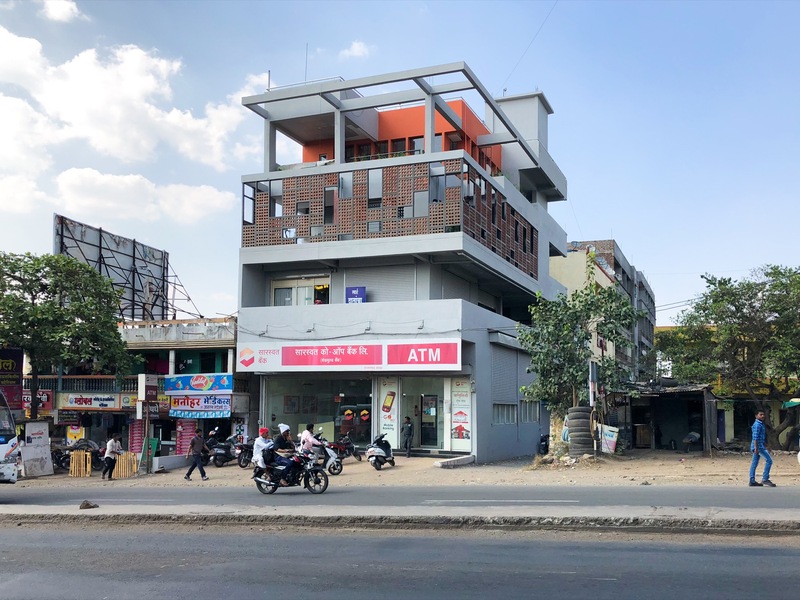 The project was about redesigning a 3 floor high building which flanked a busy highway and was among the only 3 tall buildings in the vicinity. It was in the village of Ranjangaon which is a Grampanchayat town on Pune-Ahmednagar highway. The place is known for its Ashtavinayak Ganesh temple- one of the eight revered temples of Ganesh. It is also known for a large Industrial cluster with the presence of many German and Italian manufacturing companies. 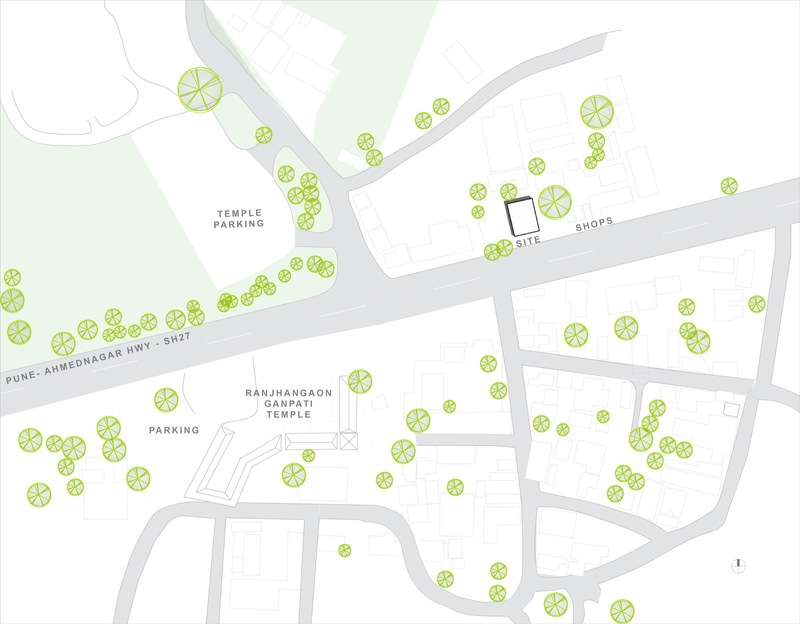 The 2 residential apartments we designed overlook the temple, the village, the highway, and the industrial cluster. The place has a striking context in the form of the pilgrimage centre and neighbouring buildings built without side setbacks, reflecting older village planning. 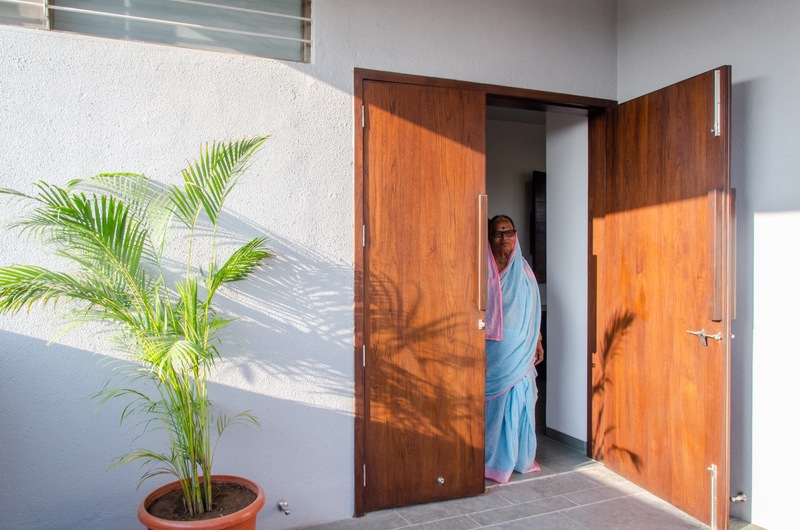 Our project was primarily designed for Mrs. Shete, a 74 yr old self-made teacher from the village who owned and managed the building. 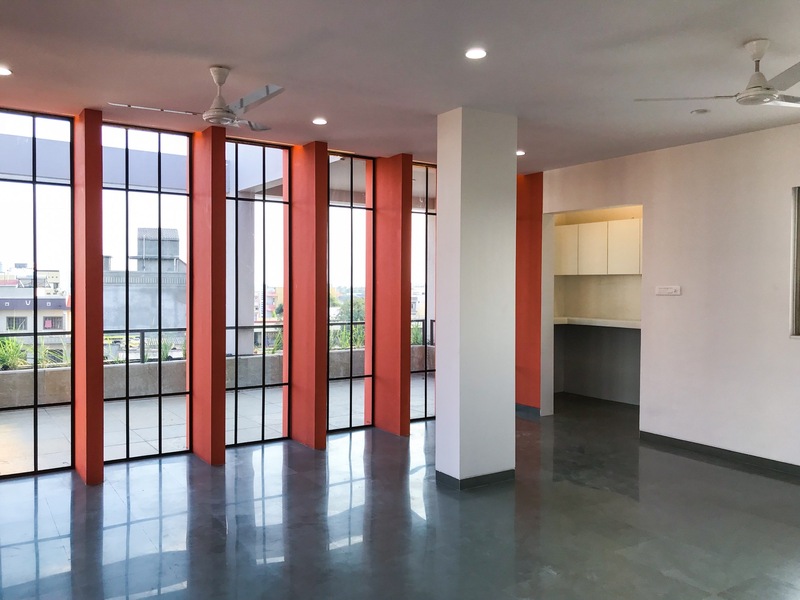 We designed one apartment for her and we designed another apartment for her son Gajendra Shete, who was our point of contact even while he worked and stayed in the US of A. 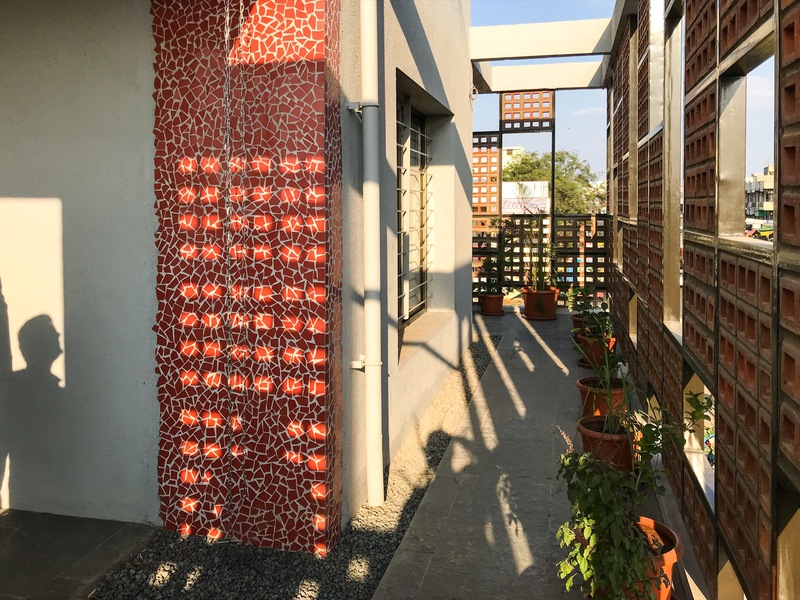 The design was meant to be answerable to an urban lifestyle, accessibility concerns, Bread and breakfast arrangement, and contextual issues of noise, dust, privacy etc. The initial brief involved a redesign of the entire building which had a set of commercial activity tenants like a bank, dental clinic and shops which were operational. We worked on the brief and convinced our clients to minimize the intervention to the building façade only. We restricted the material usage to brick, plaster, paint and readily available MS sections. In such far-flung towns it is always beneficial to work with unskilled or semiskilled labour because they are the ones who finally help maintain and support the building in the long run. Hence the design was also made in readily available basic materials easy for maintenance, replacements and additions. The building abuts a small 4m wide lane on the east side and just half a metre gap from the neighbouring building on the west. We kept the living quarters in the central portion of the house giving some open space on three sides. The service areas- toilets, utilities were all planned along the western façade. Since the building is situated along the highway, there’s constant noise and dust coming into the building. 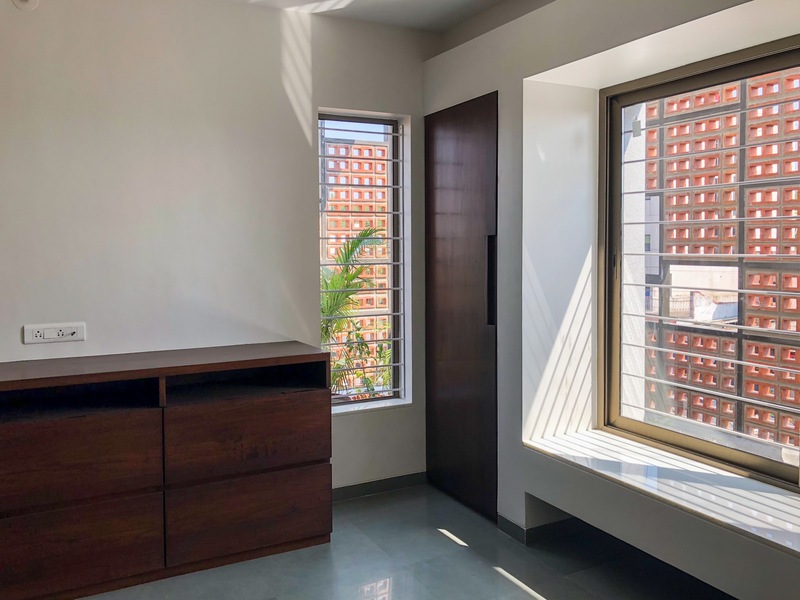 By pushing all living areas into the centre and providing a screen along the façade of Mrs. Shete’s apartment floor, a buffer space was created to reduce the noise, dust and heat and to give some much-needed privacy to the apartment. The screen on the façade ensures that adequate light and breeze percolates in to the main areas whilst maintaining privacy. 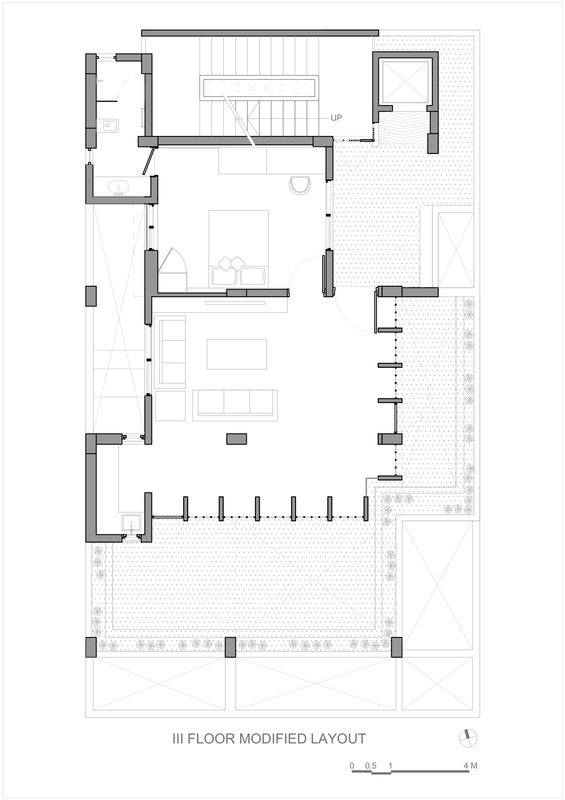 The upper floor was planned as a serviced apartment with a living space, pantry, a bedroom with an attached toilet. 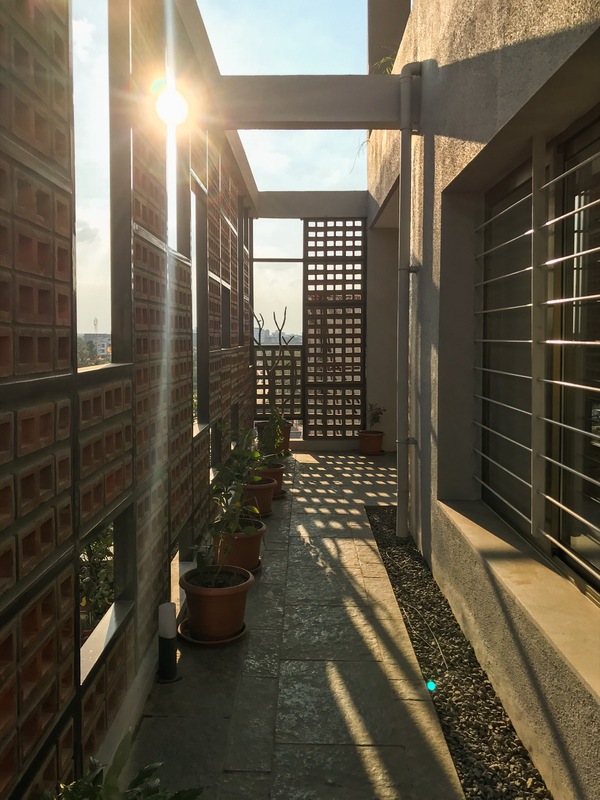 This was recessed inside to provide a buffer and privacy from the highway creating a partly covered open terrace with further visual privacy provided by plantation along the edges of the South and East open spaces. 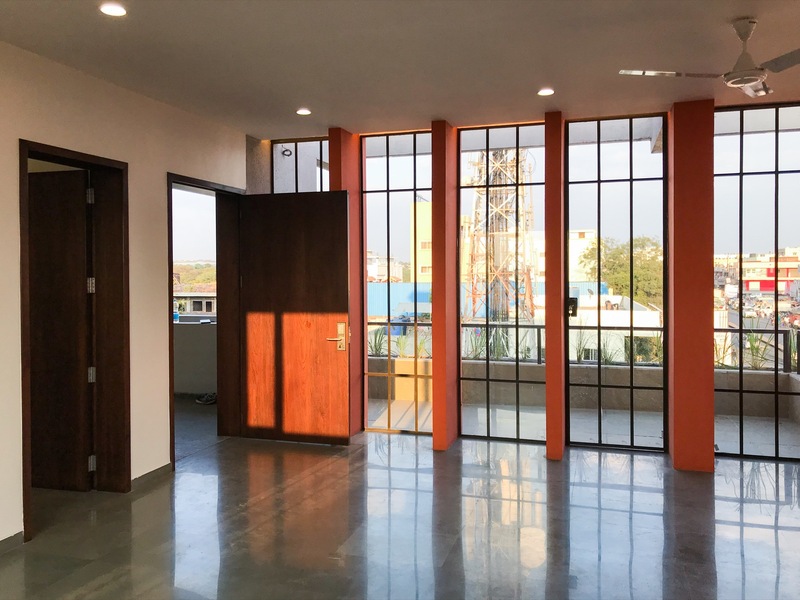 Given the abundance of sunlight, the toilets and lobbies are naturally lit with skylights without any need for artificial lighting during the daytime. The living spaces are also adequately lit naturally and do not need artificial light during the day. The finishes were kept as natural and simple as possible. 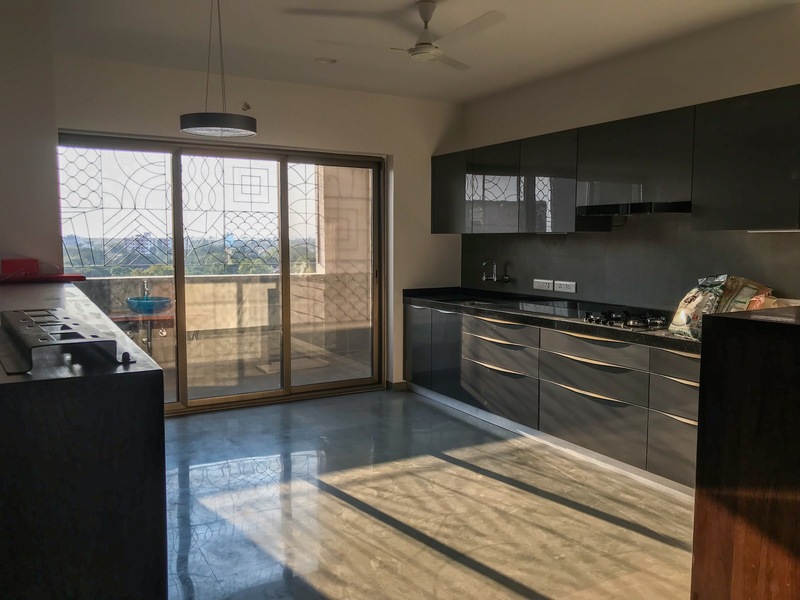 Polished natural Kota stone was used for the internal areas whereas a combination of Leather finished Kota and Shahabad stones were used in the open spaces. 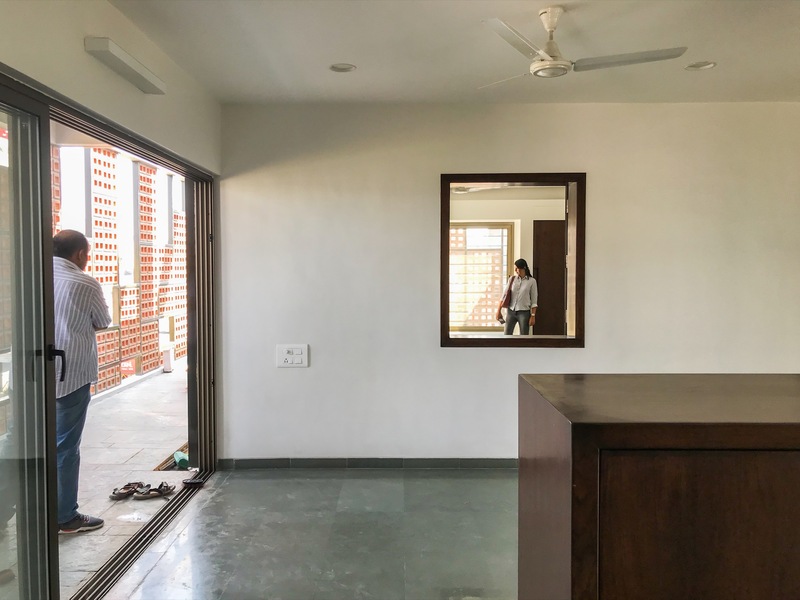 The 3 sided buffer space gives the feel of a village home with its aangan. It provides a ground and sky connection that an apartment otherwise lacks. Minimal inbuilt furniture was proposed keeping in mind that the end user had their own choice and the end use may also change with time. Contractor: H.A. Kanitkar And Co.